Susana Moreira Marques is a writer and journalist. She was born in Oporto in 1976 and now lives in Lisbon, where she writes for the radio Antena 1 and the newspaper Jornal de Negócios. 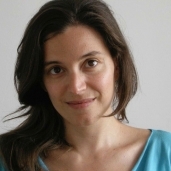 Between 2005 and 2010 Moreira Marques lived in London, working at the BBC World Service while also a correspondent for Portuguese newspaper Público. Her journalism has won several prizes, including the Prémio AMI – Jornalismo Contra a Indiferença and the 2012 UNESCO ‘Human Rights and Integration’ Journalism Award (Portugal). Now and at the Hour of Our Death is her first book.